The market of video cards offers most varied solutions, but the longest and strongest rivals in this niche are of course NVIDIA and AMD/ATI. We were really intrigued by the opportunity to test the two rather powerful products based on Radeon X1900GT chips by AMD/ATI and on GeForce 7950GT by NVIDIA. 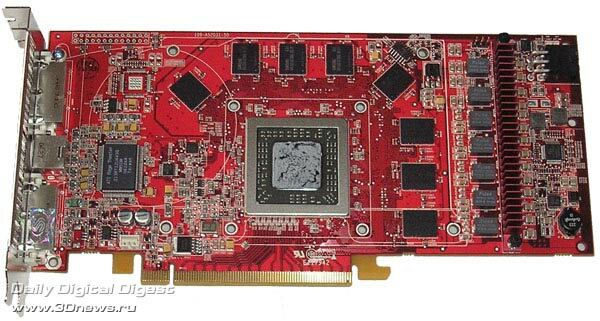 Today, we'll be looking at the battle between Point of View GeForce 7950GT 512 MB and Sapphire Radeon X1900XT 256 MB of the same pricing range. 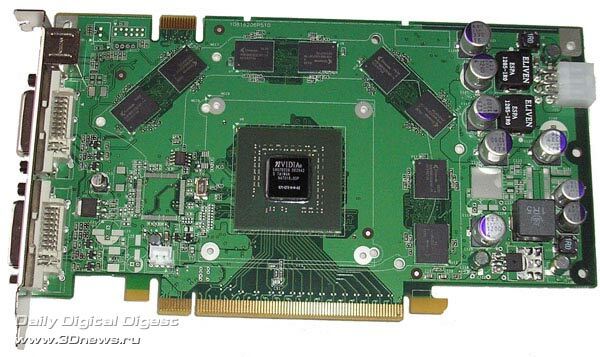 A few months ago NVIDIA announced its video processors GeForce 7950GT and GeForce 7900GS. Both the chips are very similar in structure, which is no wonder because they originate from the same prototype. These modified solutions have come to take the place of the already laid off GeForce 7900GT. Although they originate from the same root, they differ in the technology specifics which affected the changes in their structure. GeForce 7900GS is produced through reduction in the number of pipelines to 20/7, whereas GeForce 7950GT has preserved its pipeline formula 24/8 but acquired much higher clock speeds – the production technology is polished enough and stands out with its high stability, which allowed to overclock it a bit. We decided to explore the capabilities of GeForce 7950GT chip on the example of a board made by Point of View. Finally, we got the brightly styled box traditional for the company. Among the abundance of bright stylish images on the upper cover, we can see a few labels advertising the technologies used in the product. On the reverse side, you can read more detailed data on the offered capabilities and innovative solutions. The manufacturer provisionally made up this information in multiple languages except Russian but that is quite normal and not an issue for our market. The contents of the package in question looks a bit too simple. Point of View decoded not to furnish its video card following the latest fashion trends. However, the most needed items were anyway put into the box which are more than enough in standard situations. Like in most other solutions by other manufacturers, the most eye-catching item is of course the cooling system. In our case it is standard and differs in only the upper label. We can note its low noise at the moments of maximum load. But anyway this solutions offers evident advantages. This video card takes up one slot and does not hinder using the adjoining slots on the motherboard. 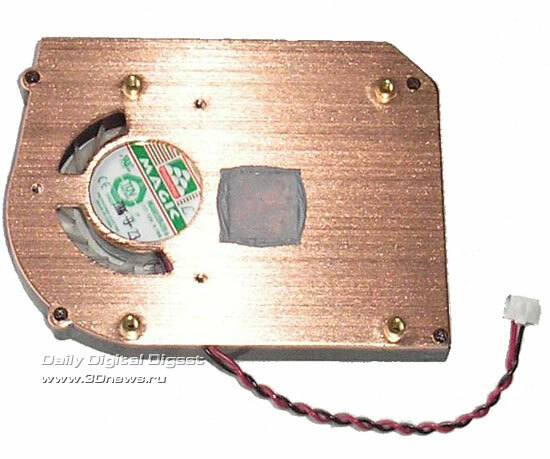 Anyway, you shouldn't place other expansion cards too close to it because that might reduce the air flow to the video card's fan, but if necessary we can enhance the air circulation inside the housing through installation of additional fans. 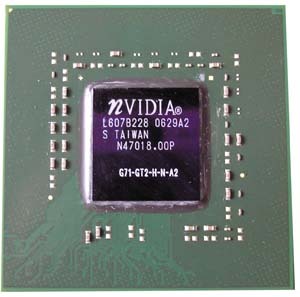 By its structure and packaging, the GeForce 7950GT chip is a complete replica of its ancestor GeForce 7900GT and thus its design and layout remain unchanged. This can be vividly seen on the photo of the video card with the cooler removed. Does it really make sense inventing something different when the old still works and is free of flaws typical for the newly developed. We'd like to note there is unsoldered space for a video capture chip, but it was missing on this model. Quite a nice solution that the user gets is the capability of handling the SLI (Scalable Link Interface) technology, which is seen through the small pin area in the upper part and the support declared by the manufacturer. This connector is meant to merge two video cards with a special cable/adapter that normally comes as a bundled item with some motherboards. Turning the video card's board over, we can see a pattern typical for most formerly seen modifications of the solution. The core of the video card, the GPU GeForce 7950GT,nor has undergone any changes. The size of the chip, layout of the bridges - all has remained the way it used to be. However, the marking reminds us some differences in the chip by the "GT2" characters. 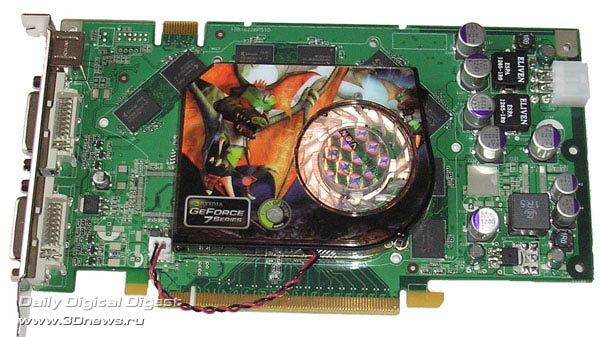 We'd like to note that the overall capacity of video memory installed on Point of View GeForce 7950GT is 512 MB. 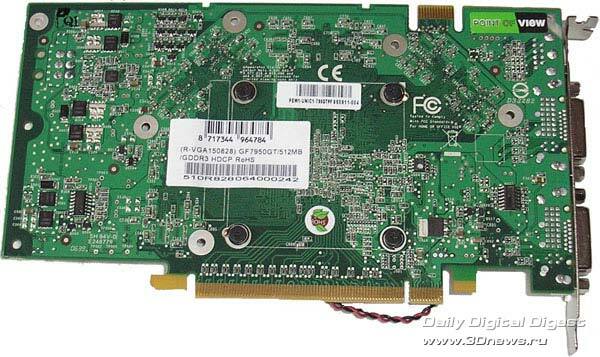 This solution also differs from GeForce 7900GT in which merely 256 MB of video memory was installed. On our board, 512 Mbit density chips were used. 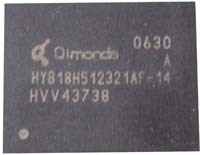 The chips made by Qimoda offer 1.4 ns access time and 1400 MHz DDR operating frequency. Now let's estimate the capabilities of the cooling system. Is it possible to improve the frequency characteristics with a standard radiator installed and produce a bit more performance boost with the same money? Let's bring in the results produced when using the standard operating mode. From the presented graphs we can observe heating of the chips to 80° at the standard operating frequency 550 MHz and memory frequency 1400 MHz. Of course, we did not stop at that. Our persistence to somehow improve the produced result after a number of experiments has led to quite interesting and good results. We should note a stable enough operation of all the system with these settings. Analyzing the graphs, we'd like to note the temperature which rose to merely 83° during the GPU operation at 594 MHz and the video memory at 1620 MHz. We were really happy to get such results. 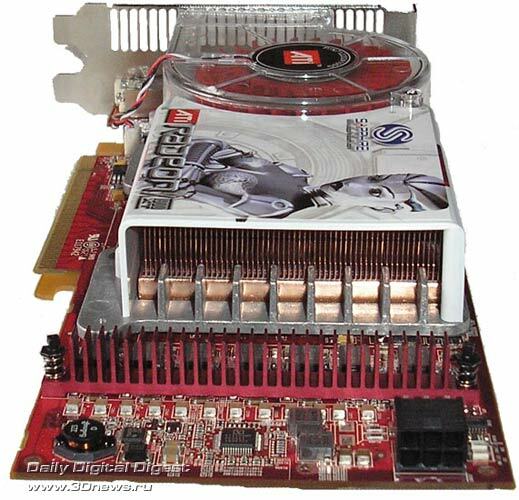 The history of Radeon X1900XT has been repeatedly mentioned in various reviews. It originates from R580 that became the starting point for solutions that emerged early this year. 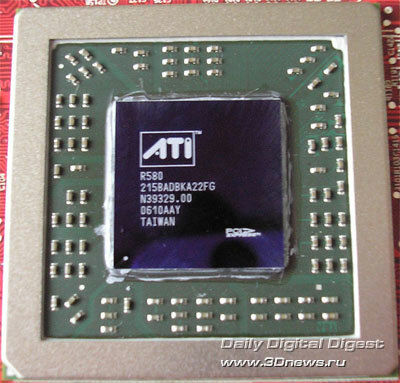 The core speed recommended by the manufacturer is 625 MHz, the operating memory is assumed to be 725 MHz (1450 MHz DDR). And 500/594 MHz in the 2D mode, respectively. The onboard video memory capacity is 256 MB with the 256-bit bus. The GPU offers 48 pixel pipelines, 8 vertex pipelines, 16 texture units. Supported are Open GL 2.0 и DirectX 9.0c (Shader Model 3.0), as well as AVIVO. This chip has proven itself well enough and is only stirs up the interest to this comparison. 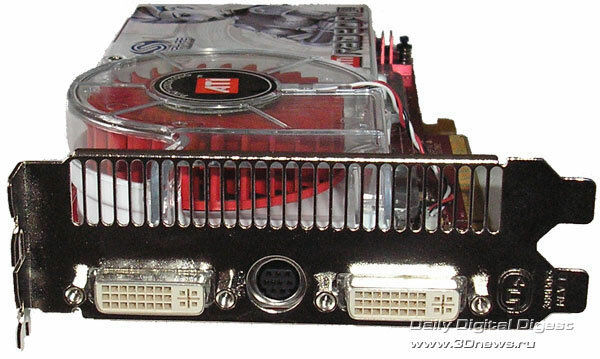 Let's review its capabilities on the example of the video card Sapphire Radeon X1900XT 256 MB. a holographic Sapphire logo sticker. All is really not bad for an OEM version. We were really happy about the opportunity to use VIVO in all the four variations with a lot of adapters. There are also two 15 pin DVI / D-Sub adapters to plug in monitors. For Hi-end video cards by AMD/ATI, use of a cooler that expels hot air outside the CPU housing is quite standard and justified. But the exclusive size of the form factor for Sapphire has remain an individual solution that makes the company stand out of the market of graphic accelerators. At the moments of maximum load it also produces a bit more noise. But, along with the competitor in review, this video card takes up two slots and with its radiator prevents using the slot adjoining to it. However, a solution like that allows expelling hot air and therefore improving the performance of the cooling system in general. It also may reduce the RPM of the cooler and thus reduce the noise level. 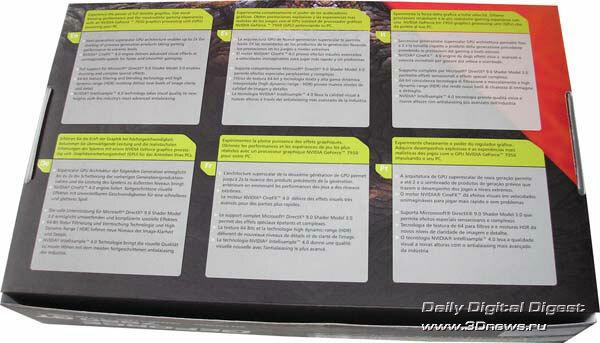 The design and layout of the board are also standard enough. That is well seen on the photo with the cooler removed. On the card, there are 2 DVI outputs installed. In the part of the board that is by the outputs, there is the Ati Rage Theatre chip which is in charge video capture and processing. The reverse side of the video card is also typical, with the fastening of the cooling system a bit outstanding. Judging by the marking, we can see that the processor was released on the 10th week of year 2006. It offers 625 MHz operating speed of the core, 256 MB onboard video memory addressed over the 256-bit bus. The memory chips are positioned only on the front side of the board. The memory runs at 720 MHz (1440 MHz DDR). 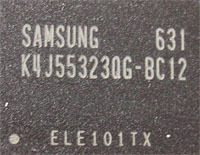 The marking of the chip suggests that the memory is made by Samsung, of 1.2 ns access time, which implies the capability of running at 800 MHz (1600 MHz DDR). In most cases, when testing video cards of the X1900XT/XTX series the overclocking capability was quite low – up to +30 MHz above the average under air-powered cooling. Using a standard cooler, we also wanted to get the most of it at the money we paid. Here are the results of video card operation under the standard mode. By the graphs, we can observe heating the chip up to 88.5° at the operating clock speed 648 MHz and at the memory frequency 720 MHz (1440 MHz). Even the spacious and a bit noisy cooling system did not justify our expectations. Of course, we did not stop at that. Having experimented a bit but keeping within the operational stability of the whole system, we were able to improve the results a bit. Although we did not achieve the average statistical results, we were able to get a 14 MHz boost, which is not an outstanding progress. Analyzing the graphs, we'd like to note the unstable temperature curve which rose up to 90.5° and all that is due to the rise of the clock speed of the GPU Radeon X1900XT up to merely 662 MHz and the memory frequency to 752.6 MHz (1505 MHz). Perhaps the video card that we received at our test lab turned out to be not the most successful in terms of overclocking. For tests, we used NVIDIA ForceWare 93.71WHQL and ATI Catalyst 6.11 WHQL drivers. Here we again see the gap of several thousand marks. And the rivals rank in the same order. At Futuremark 3DMark’05, the alignment of forces has changed a bit, the abundance of scene with shaders requires a large number of pipelines that will execute them. It is quite expectable that the first place is taken by Radeon X1900XT with 48 pixel pipelines versus 24 in GeForce 7950GT. 3DMark’06 has definitely shown the distribution of ranks by the memory frequencies. There is the evident trend that the best is the one having higher memory operating frequency. But since we were able overclocking Point of View 7950GT to 1620 MHz, it's just this video card which proved to be the leader of the test. The synthetic benchmarks do not provide a comprehensive pattern, so we'd rather move on directly to the purposes each card is aimed at. At gaming benchmarks we used the 2 modes: resolution 1024x768 and 1280x1024 with the maximum anti-aliasing and AF settings which the game allows using. Far Cry is not new but up till now it has still been able generating a high load upon both the video card and the CPU. It's just the latter which proved to be the bottleneck because both video cards running in the most demanding modes are more than enough for the game, and the difference in results is determined by the measurement errors and the requirements to video drivers in computational resources. In this "round", GeForce 7950GT has proven itself not bad. In fact, at this resolution the test is not indicative because the results are bounded by the CPU performance. Rise of resolution results in a more vivid gap between the test participants - Point of View GeForce 7950GT 512 MB leaves the rivals well behind. In the overclocked state, we get even more substantial advantage. The graphs show a rather tight and tough competition between the participants because all the results are pretty close. 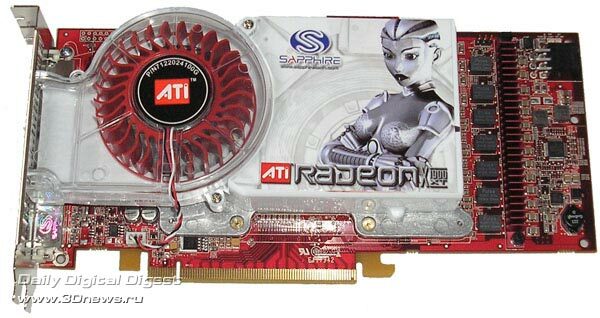 But at standard frequencies the video card by Point of View albeit little but lagged behind Sapphire Radeon X1900XT 256 MB. However, using its overclocking capability the chip GeForce 7950GT anyway grabs the leadership crown at these competitions. Although the rise of load upon the graphic system does not change the ranking, it shows a more vivid advantage of AMD/ATI chip at standard frequencies. The engine of DOOM 3 is more optimized for NVIDIA cards. So the produced results are quite logical. Even at the nominal frequencies the gap between the video cards is wide enough. Increase of the resolution does not change the pattern. The proportions of the gap have not changed. We finally found preferences of video cards based on AMD/ATI chips. At F.E.A.R., more dynamic and close to the games of tomorrow, all the bonuses have gone to Sapphire Radeon X1900XT 256 MB. As resolution goes up, Radeon X1900XT preserves its leadership. Even at standard frequencies it leaves the competitor well behind. Despite the OEM version which we got for tests, we did like the package bundle of Sapphire Radeon X1900XT, but the 256 MB of memory installed on it a bit restrict the speed characteristics at greater volumes of graphic data processed. Nor the cooling system on Sapphire's board has justified our expectations. Probably those are the specific traits of the specimen which we got, but the high temperature, huge dimensions (2 slots are taken up) and the high noise are annoying. Point of View GeForce 7950GT is pretty moderate at its accessories and the onboard 512 MB memory is certainly of good aid. Point of View has also stood out for the small size of the radiator (takes up 1 slot). 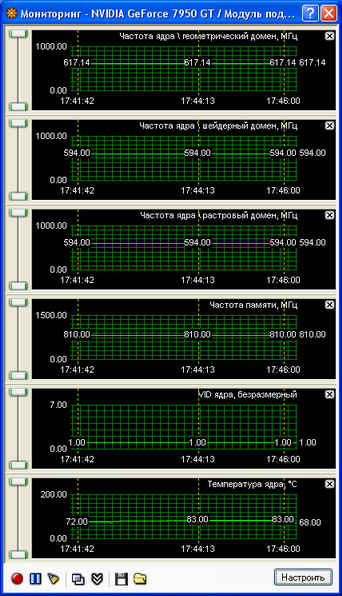 The temperature at even the overclocked state in GeForce 7950GT chip remained at a relatively acceptable level (83°С). 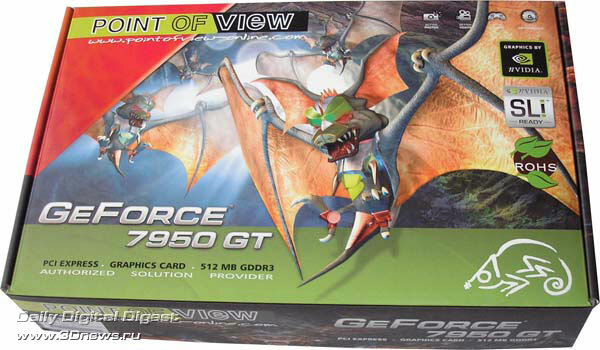 By the results of the tests, we can give the leadership crown to GeForce 7950GT by Point of View. Although it loses a bit in terms of the architecture, it shows a minor superiority at most tests, and considering the overclocking capability of the standard cooling system it becomes very attractive to the end user. 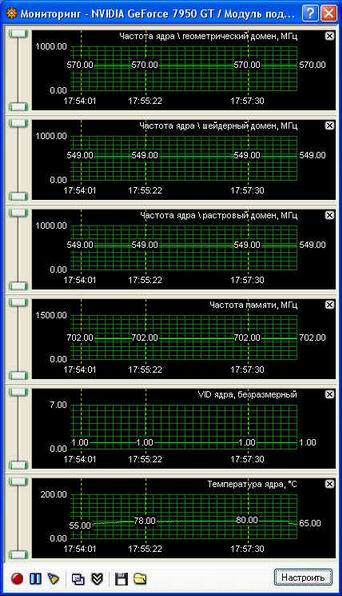 We note once again that the price of these video cards on the date of writing the material is a bit more than$300 (as per price.ru). Генерация страницы: 0.065 с. Всего 8 запросов к базе.